As you can tell from my recent community garden post, our harvest days are starting to get underway, just in time for August. I was able to freeze 3 or 4 cups of peas from our last producing row, but the green beans and tomatoes won’t be ready for a little while yet. 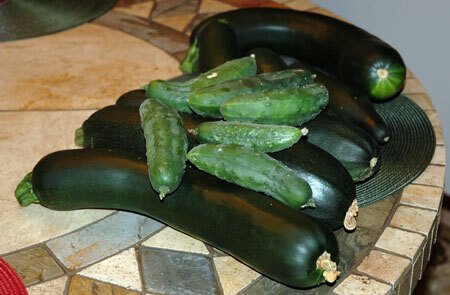 Right now the zucchini and cucumber plants are striving valiantly to fill the gap and keep us eating our vegetables. What you see here is just over a pound of pickling cucumbers from our backyard, and at least 10 pounds of zucchini from the community plots. The pile has grown since this photo was taken, despite all our attempts to keep up with it. 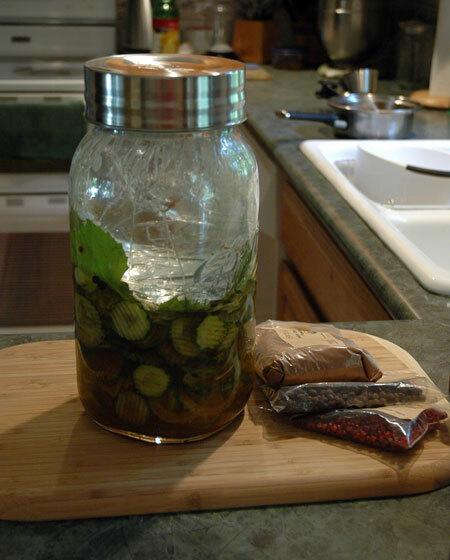 My first order of business was to get the pickling cukes fermenting. I made some garlic-dill spears very successfully last year, but my dad is a sweet pickle guy, so for this first batch I am trying a new recipe that is sweetened with maple syrup. 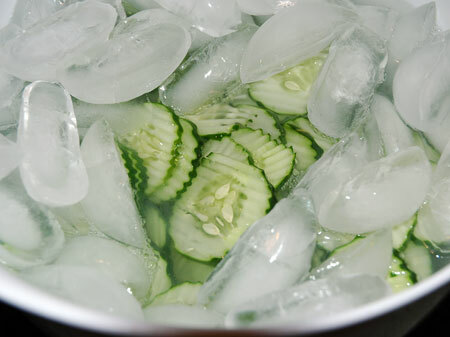 Adding to the experimental factor, I decided to use the ripple slicer on my mandoline this time, and also soaked the slices overnight in ice water with a little pickling lime. The pickles have just finished fermenting in a gallon-sized jar on the kitchen counter (the photo shows them freshly interred, still very green and raw), with my parents frequently commenting on how pretty they look layered with onions and whole spices, and how exciting to see the bubbles filtering up to the surface. The batch sat out for about a week to get the flavor and texture we were looking for; I think that the air conditioning in my parents’ house slowed down the culture somewhat. At the moment, they have a definite sweet-and-sour flavor. Personally, I didn’t care for them much, probably because I have gotten used to the sour saltiness of the garlic-dill pickles I made last year, so my dad can have these (which fit into two quart jars) and the next batch will be sour dill pickles for me, cut without ripples to visually separate them from the sweets. As for the zucchini, we have started eating it with at least one meal every day. 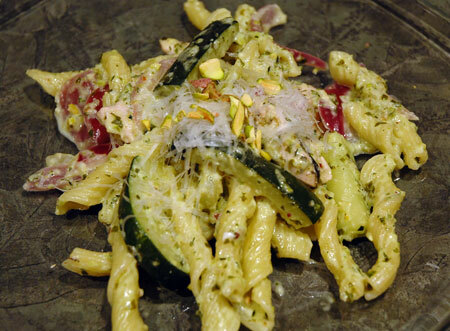 The first selection was a summery pasta dish with sauteed zucchini and red onion, in addition to a creamy pesto sauce made with pistachios and more raw zucchini. I rounded the dish out with some leftover chicken souvlaki, which fit in seamlessly. It was really delicious, and I loved the pop of color from the onion amid all that green. Next up was a batch of zucchini-corn fritters, whipped up in no more than 15 minutes on our way out the door to an event. The friends we carpooled with used the same amount of time to swing by McDonald’s, so I was really patting myself on the back. 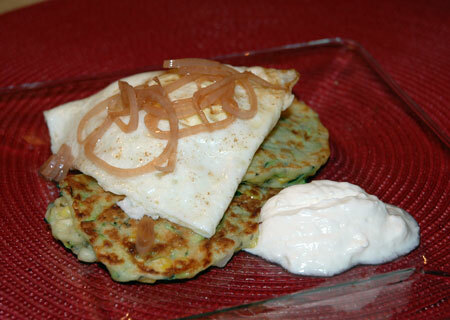 I didn’t have time to make a real dipping sauce or accompaniments this time, so I just fried up eggs to go on top with a few pickled shallots, and spooned a dollop of plain yogurt on the side. Some of our zucchini is so huge that this recipe needed no more than half of one squash, and I used the rest of the shreds the next morning to make zippy muffins for breakfast. This summer pasta dish highlights zucchini in two ways: sauteed with red onion and garlic, and ground raw into a bright herby pistou that clings to the pasta with a splash of cream. If your zucchini is very large, you may want to omit the seedy core and consider peeling part of the peel, which can become bitter. Cook the pasta in boiling water as directed on the package, reserving 1/3 cup of the pasta water when you drain it. Place 1 C raw chunked zucchini in a food processor along with the basil, 1/4 C Parmigiano Reggiano, 1 clove garlic, pistachios, lemon juice, salt and pepper. Process until finely chopped but not pureed; if the mixture is too dry to move easily in the processor, add a splash of olive oil or some of the reserved pasta water. When the pasta is al dente, drain it and transfer it to the skillet over low heat with the vegetables; I used my spider for this task. Add a big dollop of the pistou to the pasta along with the heavy cream and toss to coat; you can adjust the consistency of the sauce by adding more pistou, pasta water or cream. Serve garnished with chopped pistachios, grated Parmigiano Peggiano, and fresh cracked pepper. Source: Slightly adapted from Closet Cooking. Still to come in Zucchinifest 2011, zucchini soup, salads and salad dressings, slaws and pickles, zucchini-wrapped fish, zucchini smoothies and possibly catsups, zucchini cake and candied zucchini, and yes, probably even the obligatory stuffed zucchini canoes.